I read a post on LISNews today about a "book bar" trend that is starting in the UK. Lichen had brought up this idea before, and I still like it - make libraries more inviting in general, rather than just hoping people like what we have where we have it how we have it. 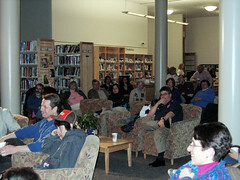 My library is having a "Coffeehouse @ the Library" series as part of our larger One Book Chelmsford program, and the response has been great. The first one was well attended (see photos), and patrons are looking forward to the second (which is tonight, so come if you can!). And I'm hoping that if we can demonstrate desire and attendance among patrons, then this can be a regular program. Posted under Library, Marketing, Programs on Friday, April 20th, 2007 at 2:26 pm, by Brian Herzog. Post and comments available via the RSS 2.0 feed. Both comments and pings are currently closed.